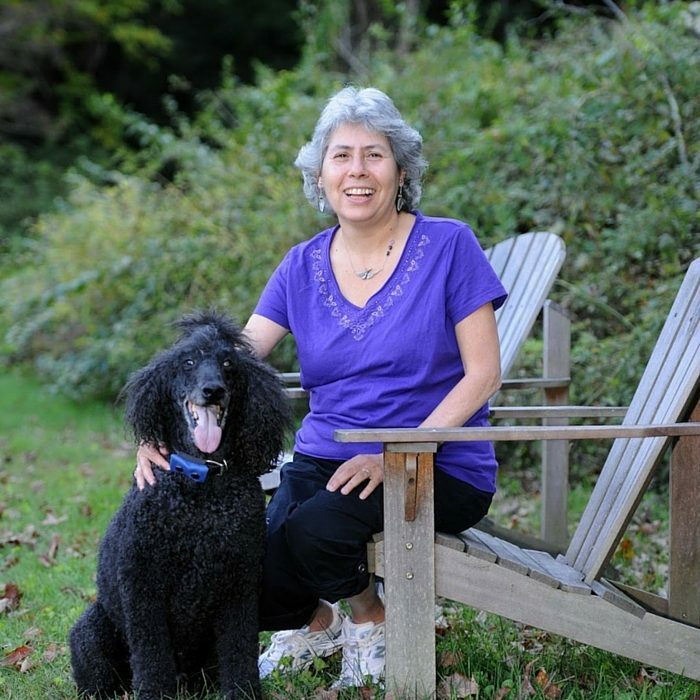 Today we have a very special guest on the blog: poet, Marilyn Singer! Ms. Singer has written over a hundred books for children in many different genres. She made up an alien language in The Boy Who Cried Alien and invented her own style of poetry in Mirror Mirror. Read the interview below and be sure to listen to the audio podcast, as well, and learn more about this inventive poet! Welcome, Marilyn! Tell us a little about yourself. How did you get started writing? When I was very young, my parents read me poetry, as well as fairy tales and other stories. I remember especially loving The Little Golden Book of Poetry. They also sang me the popular songs of the day and the songs they grew up with, so I loved poems and lyrics at an early age. My Romanian grandmother, who lived with us, told me stories every night. So I also got a feeling for the oral (and aural) tradition. Poetry and fairy tales share that in common. I started writing poems in third grade. I used to read them at Show & Tell, which may not have delighted my fellow classmates, but it sure pleased my teachers. Thanks to a teacher who submitted my poems, I had some things published in literary magazines, and that may have led me to believe that I could get published as a grown-up, too. But I became a high school English teacher instead and I didn't consider writing as a serious career until I left teaching after a short three years. I recalled insect characters I had made up when I was eight and I wrote stories about them. Those stories led to others. I was very fortunate when in 1976 my first one was accepted—a picture book entitled The Dog Who Insisted He Wasn't. It wasn't until some years later that my first poetry book for children, Turtle in July, was published. Since then, I’ve continued to write in many genres, but poetry remains my favorite thing to write. Speaking of poetry, we love the way you use language and form in unorthodox ways in your poems. What is "reverso" or mirror poetry and what inspired you to create it? A reverso is a poem with two halves. The second half reverses the lines from the first half, with changes only in punctuation and capitalization—and it has to say something completely different from the first half or it’s what one blogger’s kid called a same-o. My husband, Steve Aronson, came up with the word “reverso,” and I thank him every day for that! I got excited and wondered if I could write more like it. So I did. The poems were on a variety of topics, but an editor suggested I base all of them on fairy tales. That was a challenging, but exciting idea, and since I like a good challenge, I decided to try. The collection became Mirror Mirror. Since then I’ve written two more collections of reversos and a number of individual reversos for other collections. You’ve talked about how your love of poetry developed from your love of musicians like Cole Porter and Johnny Mercer. What can writers and readers of poetry learn from musicians? I have several books with reproductions of lyrics by Porter and other lyricists. You can see words they crossed out and replaced, lists of possible rhymes, etc. I have found these encouraging. They show how these writers knew that if a rhyme doesn’t work, you look for another—or rewrite the lines entirely. If a word isn’t perfect, find one that is. Porter, Mercer, Sondheim, and others were masters at choosing the right words and at rhyming. And they had great musicality, which, in my opinion, poetry must have, even if it doesn’t rhyme. So, I think folks can learn a lot about poetry from these composers/lyricists. This spring you're releasing a book of reverso poetry based on Greek mythology. We'd love to hear more! What are some of your favorite myths? I’ve always liked “Arachne and Athena.” I love that we got the word “arachnid” from this myth, and I kind of get a kick out of two characters who act rather unpleasant. ;-) Two other favorites are “Orpheus and Eurydice,” which is a great love story with a sad ending that inspired a wonderful film, Black Orpheus, and “Pygmalion and Galatea,” which is a great love story with a happy ending that inspired a terrific play, Pygmalion. What's your number one advice to kids who want to write poetry? Play with words and images and have fun! Welcome to our first Poetry Teatime Broadcast! 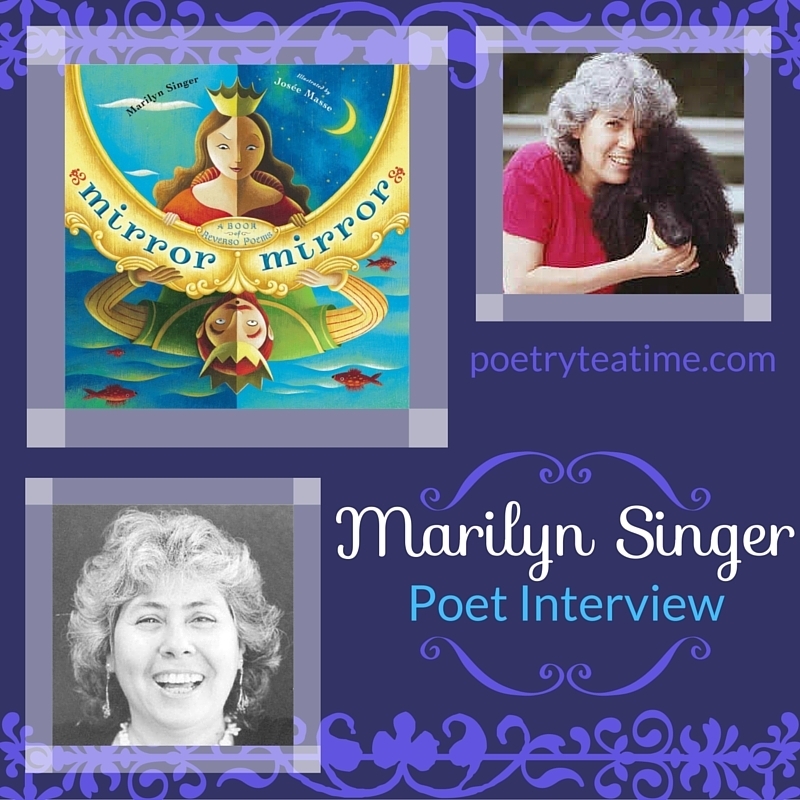 I was honored to interview Marilyn Singer, award-winning poet and author. Marilyn and I met for the interview long distance—she, in her home in Brooklyn, and me, Julie, in a library in Cincinnati. Unfortunately the library failed us, a bit. The Internet connection was variable throughout and you will notice that in the recording. Stay with it, though. The content is fabulous (delightful) and the sound improves. You will hear the cooing of her doves in the background at times, too. Enjoy! Thank you so much for joining us, Marilyn! Be sure to explore Marilyn’s wonderful books of poetry, including Mirror Mirror and its sequel Follow Follow!